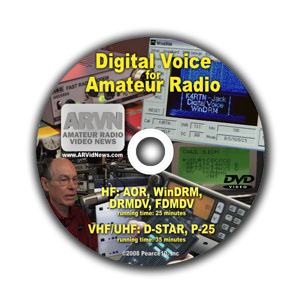 Digital Voice for Amateur Radio was the most complex of the three documentaries that HamRadioNow's Gary Pearce KN4AQ produced for DVD, before starting the online show. In 2007, Gary traveled to Alabama and Dallas in one trip, Chicago and St. Louis in another, and Washington DC in a third to gather interviews and footage of what was then just emerging as Digital Voice systems for Amateur Radio. The program was edited and released on DVD in 2008. The DV modes included an HF mode called WinDRM (which evolved to today's FreeDV), and VHF/UHF modes D-STAR and P-25. Of course, these modes have evolved since this program was produced, and newer modes like DMR, Yaesu System Fusion, and NXDN have been developed. Consider this program a snapshot in the early history of Amateur Radio Digital Voice. It's certainly not a current tutorial on operating those modes today. David and Gary catch up on the final details of all the proposals and revisions that are going into the ARRL Board of Directors meeting this weekend. Is it too late to tell you that the important meat of this show runs a scant 90 minutes. Get in at the 7:45 mark, and you'll be done about 93 minutes. The last 45 is just David and Gary goofing around. In that 90 minutes we review what's been going on with the ARRL, from the Code of Conduct to the proposed revisions to the Bylaws and Articles of Association. We look at a new group that's formed to protest some of the ARRL Board's actions. And mostly we read some detailed responses to inquiries that Gary and others sent to some of the Directors. They're not coming on the shows yet, but they are being more responsive than we saw initially (though, as Roanoke Division Director Dr. Jim Boehner N2ZZ noted, those responses won't satisfy many critics). That new group is called myARRLvoice. Some members of the 'steering committee' for the group are former Board members who could not speak in opposition to League policies until their terms expired on January 1. Now they can. Their web site will have links to the documents we reference in the show. Radio Rating: A+. As usual, a few web sites, but we don't even put the text we're reading on the screen (Gary didn't have time to format it). [The 'Radio Rating' does not measure the quality of the program content. It's our guess as to how much you lose if you aren't watching the video of the show].